Here’s another offer on Paytm to get free Paytm cash code worth 15 Rs. Purchase any Coke/ Coca Cola pack of 500ML or more and you will get a Paytm cash code inside it. By redeeming by given steps in this post, you will get Paytm cash Instantly to your wallet. Paytm Coca cola offer is valid for all users. On participating for more than 3 times from the same mobile number every week, the participant becomes eligible for a national level lucky draw (Tamil Nadu excluded). One winner from the lucky draw every week gets Rs.1 lac Paytm Cash. 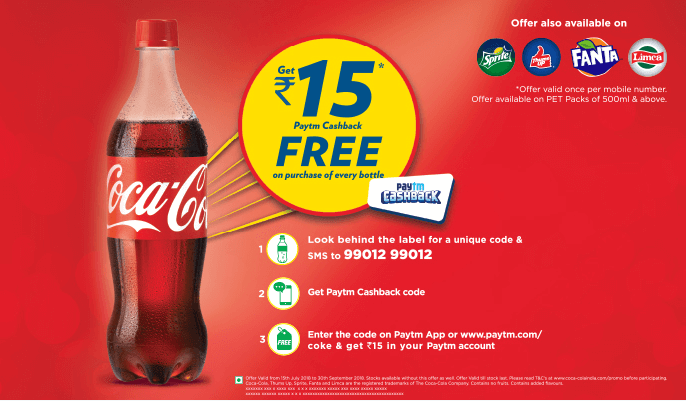 This Paytm coca cola offer is valid from 15 July 2018 to 30 September 2018. Offer Valid once per Mobile number/Paytm user. What is Paytm Coca Cola offer? Paytm is giving free Paytm cash worth 15 Rs on Coca Cola bottle. You need to look for a unique code behind the coca cola banner. Send that code to 9901299012 and you will get a Free Paytm cash code. Which can be redeemed by visiting https://paytm.com/coke. Additionally, If you participate in this offer more than 3 times from the same mobile number, you will get a chance to win 1 Rs Paytm cash. Which Coke bottle should I purchase to avail Paytm offer? This offer is valid on Sprite/ Thumbs Up/ Coca Cola/ Fanta/ Limca – 500ml, 600ml 750ml, 1.25 Litre, 2 Litre or 2.25 Litre PET bottles. First of all, Visit your Nearest store and buy a Coca-Cola pack of minimum 500ML. Make sure this is new pack and Paytm coca cola offer is mentioned on it. Look behind the label for a 16 digit unique code. Now you need to enter this 14 digit code on https://paytm.com/coke and you will get 15 Rs Cash Instantly to your Paytm wallet. 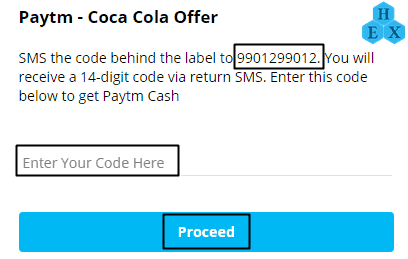 Steps are given below to redeem Coca-cola cash code on Paytm. Enter your Paytm Coke cash code and click on Proceed. Login using Paytm username and password or Create a new account. That’s it, you will get Free Paytm Cash worth 15 Rs to your wallet. You can use this balance to transfer to a friend, Recharge, Bill Payment, Shopping etc. This offer is valid from 15 July 2018 to 30 September 2018. You can redeem code during the offer period only. Offer is valid once per user/Mobile number. If you participate more than 3 times every week from the same Mobile number, You will get a chance to win 1 Lac Paytm cash. Visit www.paytm.com/Coke to redeem the code. Paytm Coca cola offer is valid for all users. Terms and Conditions for Paytm Coca cola offer. Still, If you have any doubt, Just ask in the comments box below and I will help you as soon as possible. Keep visiting Hexcode for latest Coupon and offers, Also Don’t forget to share this post with your friends and let them know about this offer.